Commerce Township: The Michigan Department of Transportation (MDOT) and Commerce Township invite bicycle and pedestrian traffic to enjoy the new M-5 Pedestrian Bridge. Total project cost was $6,013,185, funded primarily by the Federal Congestion Mitigation and Air Quality (CMAQ) program via MDOT, with $940,665 from the state. Additional costs of $1,045,909 for enhanced aesthetics, including signage and lighting, were contributed by Commerce Township and will be installed in early 2019. A formal bridge opening celebration is expected in the spring after the final design elements are installed. The bridge connects two segments of the Michigan Air Line Trail, offering safe passage over the busy M-5 highway. 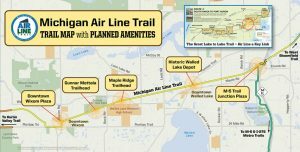 The Air Line is a multi-use rail-trail that passes through the communities of Wixom, Walled Lake and Commerce Township. The bridge also will afford easy access to the M-5 Metro Trail, which leads south from the Air Line to the I-275 Metro Trail. The Air Line Trail and eight road crossings are scheduled to be improved next year, with construction anticipated to begin late winter/early spring of 2019. “We are thrilled to have the bridge open; our three municipalities are excited to see this vision come to life, knowing it will increase the opportunity to get outside, exercise, or simply enjoy nature” said Trail Council President David Scott.